Even, smooth coatings, charming bright colors, and velvety textures, these are the features of matte lipsticks, which are now at the height of fashion. Every girl who follows fashion trends owns a matte lipstick. The main thing is to apply it properly. Keep in mind that some matte lipsticks desiccate the skin. In addition, this lipstick does not mask minor cracks and other flaws. It actually emphasizes them. It is important that you keep up with your lip care by using balms and scrubs; to achieve the best look, the skin of the lips must be perfect prior to applying a matte lipstick. After having applied some type of moisturizing lip balm, apply a little loose powder on your lips. Next, contour your lips and lead the line depending on what effect you want to achieve. If you want to visually enlarge your lips, then the line should go just to the natural boundaries of the lips, and vice versa. Note that matte lipstick can visually reduce the size of one’s lips. If your lips are not large in volume and size, such lipstick should be used carefully. After applying the lipstick, you can once again powder your lips, wet them with a napkin, and apply another coat. This will make the matte lipstick even more durable. Matte lipsticks can go a long time without fading or erasing, even if you are going out to eat. Looking for the perfect lipstick to wear when kissing someone? Congratulations, this type of lipstick will not let you down. Matte lipstick is generally considered the most long-lasting among other lipsticks, and it is perfect for daytime makeup. Besides, there are many colors you can choose from. Choose a lipstick that will emphasize your natural beauty by picking a shade that is in harmony with the color of your hair, eyes, and skin tone. Carefully review the composition of the lipstick; it's great if it includes vitamin E because it will help you avoid dryness. Ideally, matte lipsticks should not be felt on the lips; they should be weightless, a light texture. Although it happens, it does not occur often. So that's no reason to refuse giving it a try! Just spend a little more time choosing the right one, and be sure to read the reviews. The results will exceed all your expectations. Matte is stylish, modern, daring, and unusual! It is the choice of those who keep up with the times and are not afraid to announce themselves boldly. Every woman has a lipstick in her purse. The option is extremely wide. The main idea is to choose the one that will suit all your tastes and demands. At the same time it must be safe for your health and skin of your lips. There are a lot of products on the market. Lots of popular brands offer their products of the highest quality. You only need to pick up the right variant. Let’s have a closer look at matte lipstick. It has its own features and differs from all the others. At the same time you need to follow several important rules while using this kind if lipstick. Versatility is the main advantage of this lipstick. You can use it for all kinds of occasions. No matter if you are going to the party or on an important meeting. Matte lipstick will turn out to be a perfect choice for both situations. The only thing you need to consider is the fact how its color suits you clothes and make-up. Matte lipstick is very stable in comparison with all the others. You will not need to renew it after every glass of water. It will not flow. At the same time matte lipstick is not harmful for your skin. For which cases fit matte lipstick? Moreover is provides you with a very smooth and even color. It is very easy to use. That is why tis lipstick is believed to be a symbol of elegance. That is also a reason why it was the main fashion trend in 2012. It is the main choice for the majority of women. The only disadvantage of matte lipstick is the fact that it occasionally can dry your skin. However this problem can be easily solved with the help of special moisture cream. It will create a perfect look in case you have normal and health lips. 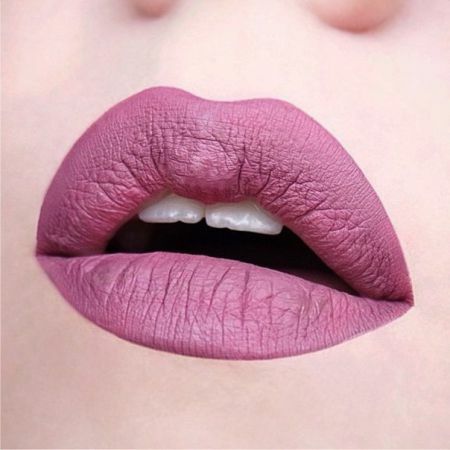 In case your lips are thin and have some drawbacks, you are not recommended to use this type of cosmetics s all drawbacks will be stressed with matte lipstick. In case you still want to use it, peeling will be necessary. Don’t forget to moisture your lips in case you want your lipstick look really great without drying effect. You can use different balms and nourishing creams. Expert’s advice: you are recommended to use liner or pencil and cover the whole surface of your lips with it inside the circuit. Then you may feel free to put a layer of matte lipstick. Always use a napkin in order to remove an overage. As soon as you are ready it is high time to make all necessary corrections with the help of a pencil or liner. You are able to use a special brush or finger for your lipstick. In case you want to make more matte effect, you may additionally use some powder or shades. There are several precautions which you should keep in mind before you buy matte lipstick. It creates a specific visual effect as if it makes your lips thinner and more flat. That is why you need to consider the size and shape of your lips while choosing such kind of cosmetics. At the same time elderly women should also be very careful while choosing matte lipstick. It can stress their wrinkles as well as other side effects and drawbacks of the aging process. That is why they are not recommended to use bright colors. Like the article «Matte Lipstick»? Share it with friends!